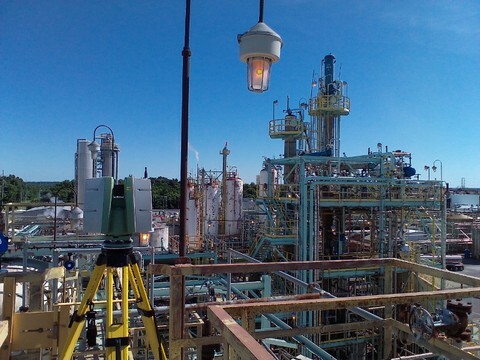 TruePoint has provided laser scanning services for clients in many industries across the United States. 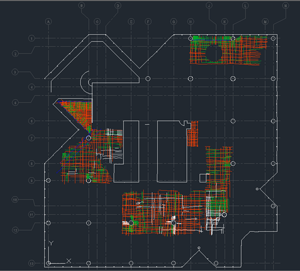 Our team of in-house scan technicians and engineers work with each client to develop an accurate understanding of the existing conditions and create custom deliverables, ranging from raw data to 2D drawings and 3D models. View our case studies to see the expertise and value that TruePoint Laser Scanning can provide. To speak to someone, please contact us today at 419-843-7226 (SCAN). Task: TruePoint provided 3D laser scanning services for a process tower and extruder room in a manufacturing facility near Nashville, Tennessee. 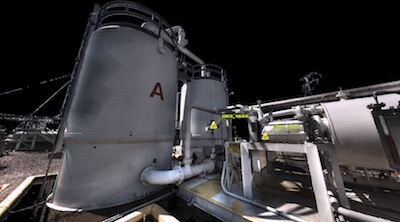 The extruder room and 11 levels of the tower were 3D laser scanned, including the structural layout, equipment footprints, dimensions of connections points, and piping tie-ins connecting the equipment. 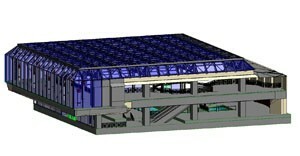 Point cloud data was collected in the project area and a 3D model was developed for the client. Task: A leading manufacturer of industrial pumps and valves needed precise measurements of an existing hydraulic lab prior to the installation of a new mining pump. TruePoint’s Georgia office quickly mobilized to 3D laser scan a 50' x 50' x 30' area, including the mechanical equipment and piping. Once this project is completed, the client will be testing the world’s largest mining pump. Task: TruePoint provided 3D laser scanning and modeling services for a 15-story structure in the greater Cincinnati, OH area. This included 8 floors of commercial space, 2 stories of retail, 5 levels of parking garage, as well as, the exterior façade and roof surface. 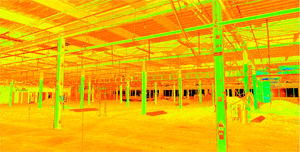 TruePoint’s laser scan technician captured over 1.54 million square-feet of space, and in-house engineers created a custom Revit model based on the point cloud of the existing conditions. Once construction was complete, this project received the 2017 Build Ohio Award for New Construction Over $30 million. Task: TruePoint 3D laser scanned a historic theater including the main floor, three balcony levels and box seats to generate a 3D Revit model for seating renovations. The target objects of data acquisition were structural features, including exposed columns and beams; and the architectural envelope of the audience area, including walls, floors, ceilings, doors, openings, railings, seats, floor and lighting. Task: TruePoint performed 3D laser scanning services for the as-built documentation of two historical homes and a Four Diamond Hotel in Laredo, Texas. With its beautiful gardens and its amazing view to Mexico and the Rio Grande River, this property is one of Laredo’s most precious legacies. TruePoint captured point cloud data for 23,000 square feet of the 1830’s-built Casa Ortiz, 9,500 square feet in the 1900’s-built Zaragoza home and 26,000 square feet of the 1916-converted La Posada Hotel. The client is planning to incorporate a new Convention Center into the property. The task was to 3D laser scan the buildings to capture architectural features such as walls, windows, doors, fixtures, and create a LOD 200 Revit model. 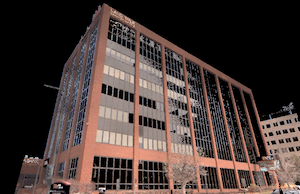 Task: TruePoint provided 3D laser scanning services to create current and accurate as-builts of a historic building in Denver, Colorado. The client was renovating an old, abandoned hotel into new apartments. TruePoint laser scanned the interior floor plan and exterior façade of the building and created a 3D model for the client. Task: TruePoint Laser Scanning developed an as-built model to aid this client in converting a historic building into a luxury hotel. 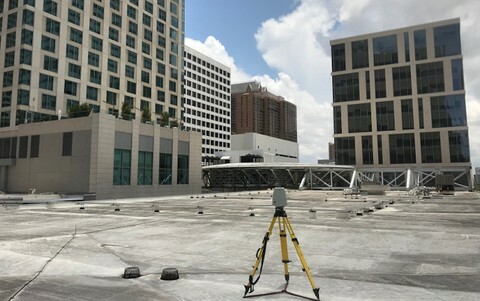 TruePoint provided 3D scanning services for a 250,000 square-foot building, including the exterior facades, floors 1-4, basement, roof, penthouses and mechanical spaces. 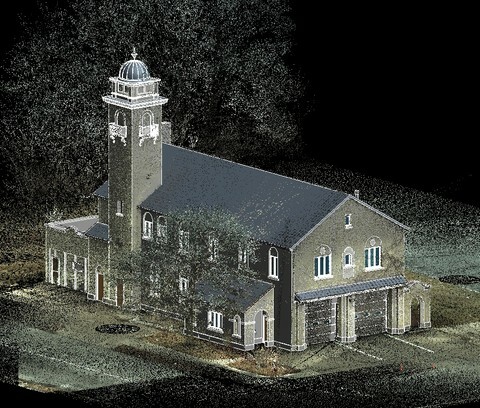 TruePoint’s team of in-house architects, engineers and CAD Technicians delivered point cloud files, a 3D model, and TruViews to the client. Task: A coal-fired power plant in Wyoming was producing 2,110 megawatts of electricity per hour from four 500-foot-high generating units that serve more than a million people throughout the region. 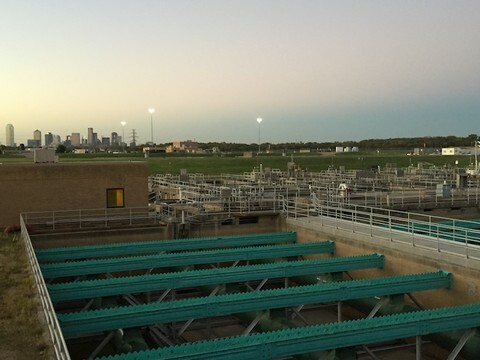 Because of its importance to the community, the plant could not afford the slightest setback in the installation of its new emission control system, which was required to comply with EPA regulations. 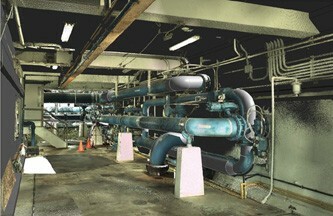 Task: To laser scan the sub-level of a 120 MGD treatment area capturing all structural, mechanical, electrical and plumbing features, equipment and piping down to ½ inch in diameter. Task: TruePoint provided laser scanning services with the primary objective of developing a 3D model of a mechanical room. The room was approximately 60 feet by 80 feet and located in a transmitter facility in Jacksonville, Florida. 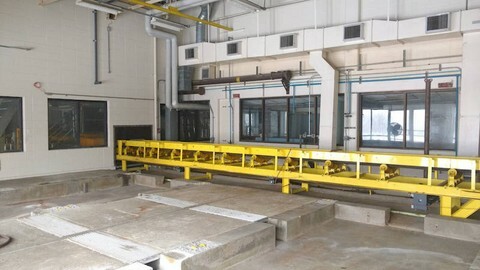 TruePoint’s targets of acquisition included the interior structure, MEP equipment, and exterior walls of the mechanical room. 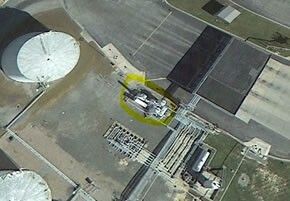 Task: TruePoint provided terrestrial-based 3D laser scanning services for a 25' x 25' x 30' oil tank near Topeka, Kansas. The objective was to capture the existing conditions of the tank, piping, flanges, nozzles, structural steel, pipe supports and grade. Task: 3D laser scan a 400-foot interior tunnel and adjacent digester tank pumps and piping for a Wastewater Treatment Plant in Columbus, Ohio. TruePoint Laser Scanning captured all structural features such as walls, floors, ceiling, columns and beams; a footprint of mechanical, electrical and plumbing equipment; and piping ½” in diameter and greater. Task: TruePoint laser scanned the column and suites to have accurate dimensions for the client to design the new patio. Task: TruePoint performed 3D laser scanning services for a theatre in Memphis. 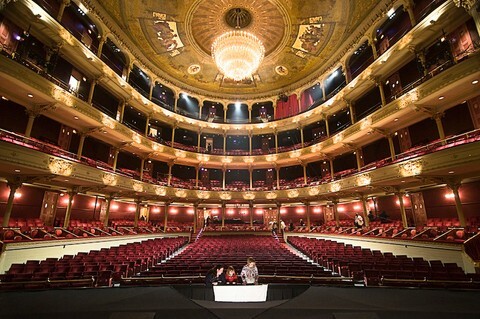 The client was adding a telescopic seating system to the orchestra pit. Precise dimensions of the pit and surrounding areas were imperative to prefabricate the seating system before installation. Task: TruePoint performed 3D laser scanning services for the exterior section of a hospital where a new pavilion will be installed. 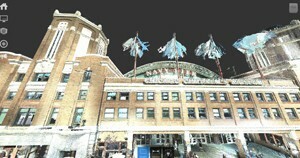 The point cloud data collected onsite was processed and provided to the client. 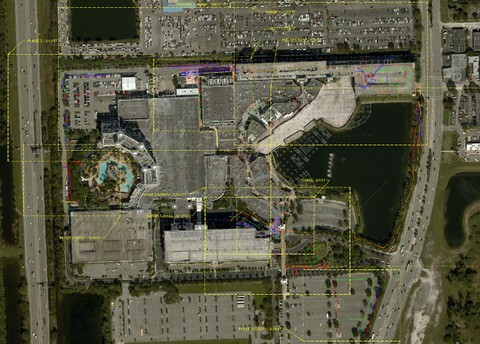 Task: TruePoint partnered with Ground Penetrating Radar Systems and a Florida Casino to create an accurate utility map to assist in efficient site excavation. GPRS located and marked all the utilities on this 100-acre property and TruePoint 3D laser scanned the markings. TruePoint’s in-house engineers created 2D drawings of the markings for the client. Task: TruePoint provided laser scanning services to capture data from a staircase and railings to generate a 3D model in STP file format. The target objects of acquisition were the staircase features including treads, rails and rail hangers. The 3D model was needed to create custom drawings to prefabricate an irregular railing. 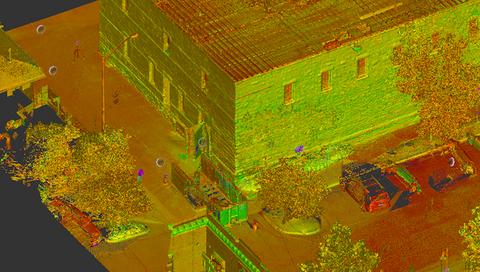 Task: TruePoint’s Kansas City office 3D laser scanned a local high school for an architect. 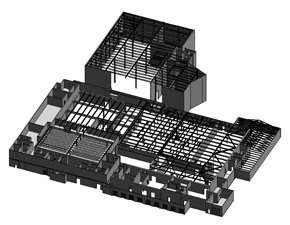 The building exterior, roof and main interior corridors of the school were 3D laser scanned to reality capture the architectural features, exposed structural features and the location of mechanical equipment on the roof. Educators, students, and community members developed a strategic plan to improve the high school experience, tasking the architect with a massive redesign to the existing school. 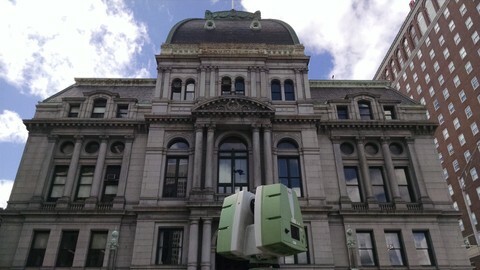 Task: TruePoint 3D laser scanned the front façade of Providence City Hall for a graphic design company that needed a 3D mesh model to plan for a holiday themed projection mapping demonstration on the building’s façade. 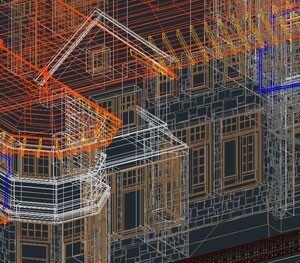 TruePoint CAD engineers developed a 200 LOD model showing walls, columns, doors, openings, ledges, sills and roofing in an .obj file format the graphic design company to develop content in VectorWorks. Task: A hotel developer plans to invest $30 million to renovate a 200-room hotel in downtown Toledo, Ohio. TruePoint performed laser scanning services to aid this client in the renovation. 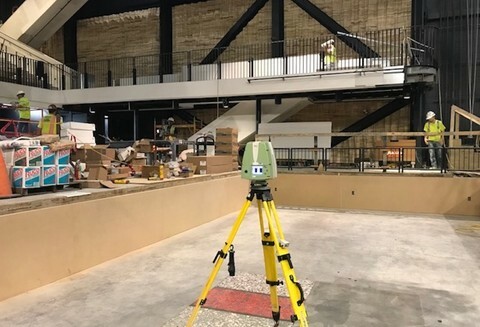 TruePoint 3D laser scanned the exterior elevation, basement, main lobby level, 2nd floor and elevator shaft – more than 30,000 square feet of space. 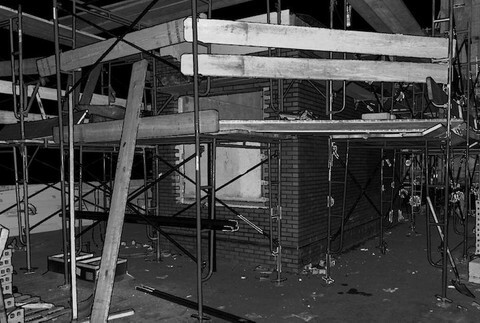 All structural and architectural features were captured as part of the scan. 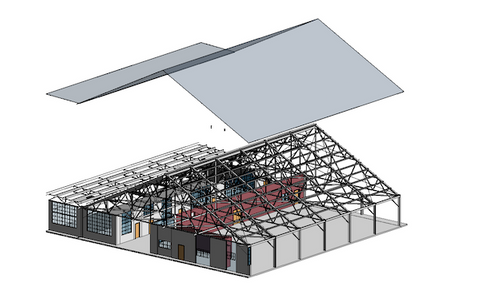 Task: An existing warehouse in Fort Worth, Texas was being converted to a metal recycling facility. 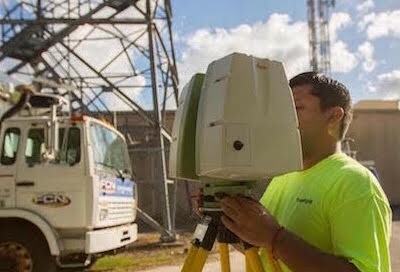 TruePoint 3D laser scanned the existing conditions so our client could conduct clash detection by incorporating the data into the design model and place new equipment without issue. 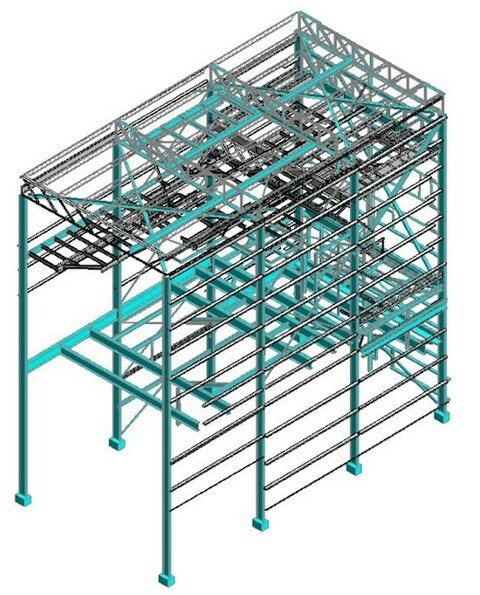 TruePoint 3D reality captured the building perimeter, interior walls, windows, doors, columns, joists, and structural steel in the 470' x 160' x 20' space. 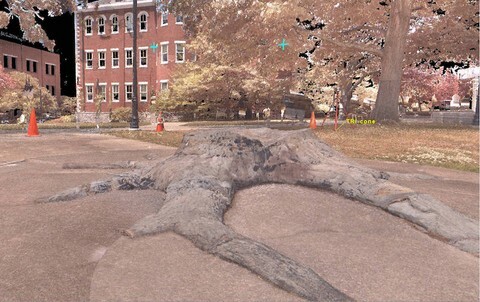 Task: TruePoint was selected by the University of Kentucky to 3D laser scan The Whitfield Stump, a three hundred-million-year-old preserved stump of a lycopod tree. The University was moving this 7,000-pound fossil from one area of campus to another. 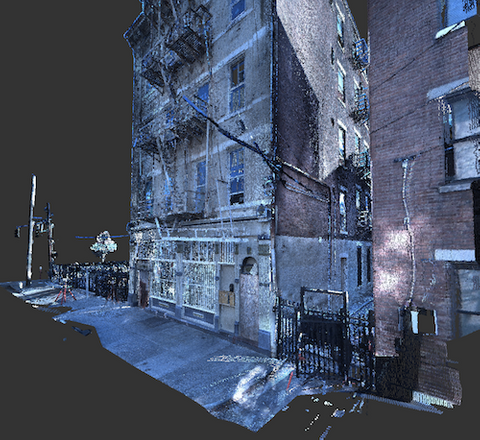 The client requested TruViews and post processing of the point cloud data to create a mesh file. 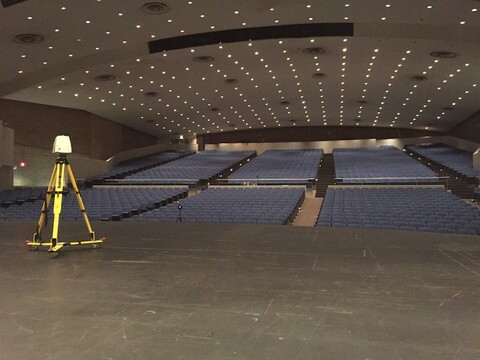 Task: TruePoint provided laser scanning services for a 22,000 square-foot multi-level auditorium in Laredo, Texas. 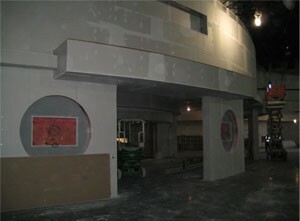 The client was renovating the seating, bathrooms, changing rooms, and designing an addition to the facility. The primary objective was to reality capture the seating, reflective ceiling, catwalk, stairs, ramps, walls, windows, doors, railings and floors. The client desired accurate measurements to design the renovation and addition. 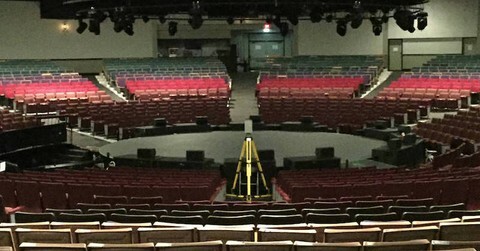 Task: TruePoint provided laser scanning services for the Arena Theater in Houston, Texas. The client desired to replace the current seating and did not have accurate drawings. The primary objective was to capture the existing dimensions of the seating, ramps, stairs, floor and stage area. The client requested the raw scan data to design the new layout of the seats. Task: TruePoint Laser Scanning was selected to high definition laser scan a production line in a manufacturing facility. The client needed high-level details on the conveyor system, equipment and associated piping where the product was bottled, labeled and packaged. Capturing the as-built conditions was necessary to make upgrades to the line. 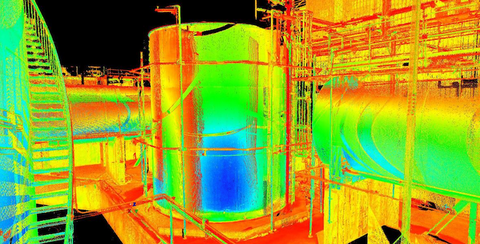 Task: TruePoint provided laser scanning services for a client to plan modifications for a new boiler system. 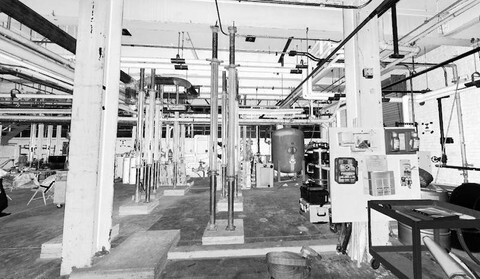 This boiler system was located in a Heating Plant on a college campus near Ypsilanti, Michigan and produces half of the electricity consumed on campus. TruePoint’s scan technician captured the structural features, equipment and MEP features of the operating floor, basement, mezzanine, roof and exterior façade. TruePoint engineers and CAD technicians delivered a 3D point cloud file that could be used to plan modifications and piping interferences. Task: The client desired to laser scan three 100-year old trees and include them in the design plans for a new development. 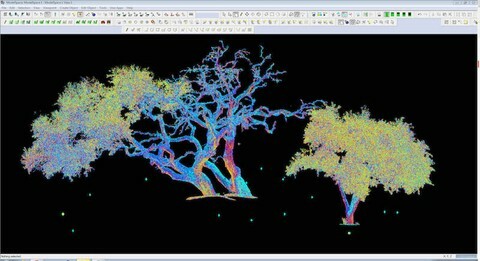 TruePoint 3D laser scanned the trees and provided the client with intensity map point cloud files and a 3D mesh of the trees for reality capture. This was TruePoint’s second phase of laser scanning for this client. Task: The client was adding a greenhouse to an existing museum. TruePoint provided 3D laser scanning services to capture the as-built conditions of the historic building façade and parapet walls. 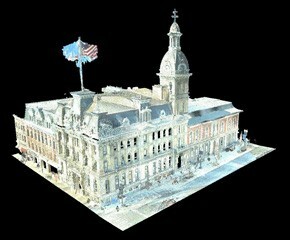 Task: Reality capture the exterior and interior of a historic courthouse. 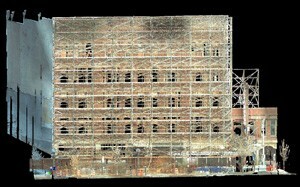 TruePoint 3D laser scanned the exterior façade, four interior floors, basement, courtyard and rooftop. All office space, courtrooms, and mechanical spaces were scanned to capture structural and architectural elements, MEP equipment and piping 2" in diameter and above. More than 93,000 square feet and 260 rooms were 3D laser scanned to provide point clouds files and 3D photographs for the client. 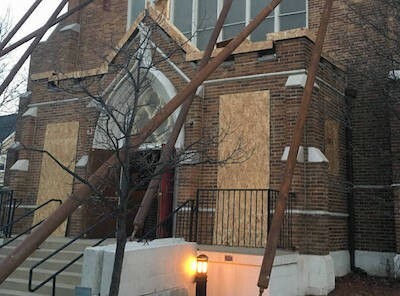 Task: The front façade of a church with a large stained-glass window was damaged during a high wind storm. During the damage assessment, the client discovered that the wood frame holding the stained-glass window in place was rotted. TruePoint provided high definition laser scanning services to capture the exact window dimensions for the client to design a new aluminum frame. 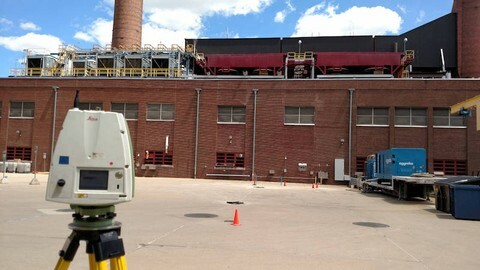 Task: TruePoint provided 3D laser scanning and modeling services for a Power Plant in Ann Arbor, Michigan, which generates and processes four main services: steam, electricity, compressed air and domestic hot water. The objective was to as-built survey the 5-level building, basement, exterior facades, rooftop areas, electrical switch gear rooms, vaults and interstitial space below the control room. 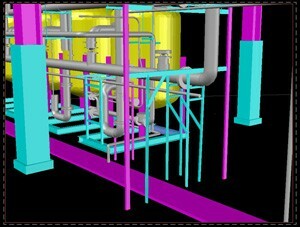 TruePoint generated a 3D model in Bentley Microstation for the client’s use. The model included all civil, structural, electrical and mechanical features, including piping and conduits ½" in diameter and larger. Task: TruePoint provided high definition laser scanning services for a mechanical room in a wastewater treatment facility in Ft. Collins, CO. The task was to capture the existing conditions of the belt press room and conveyor room, capturing all structural columns, beams, mechanical equipment, piping, conveyors and large bore piping. Task: The client was in active build of an eight-story apartment complex in Houston, Texas. Each floor had five to six concrete pours scheduled on specific dates over an 8-month period. TruePoint 3D laser scanned each area to capture the existing conduit, post-tensioning, rebar plan and sleeves prior to the slab being poured. This allowed the client to check the existing conditions for any irregularities. 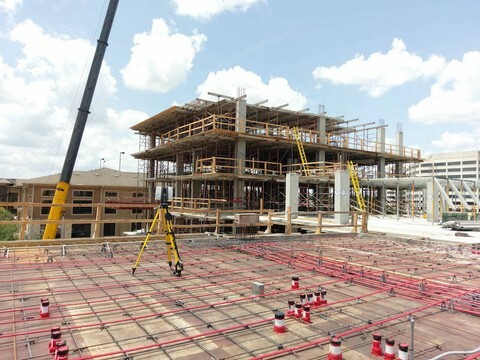 Task: TruePoint performed a 3D laser scan for a hospital in Lexington, Kentucky. 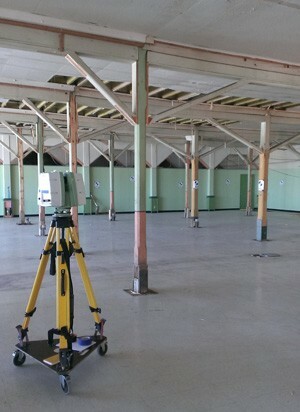 Laser scanning took place on the 3rd floor which was in a demo, or shell state. 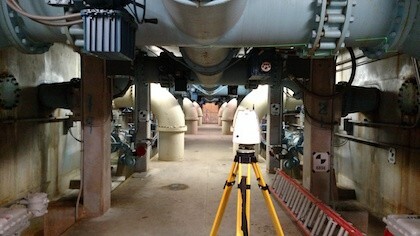 This was TruePoint’s second phase of laser scanning for ongoing work at the hospital. 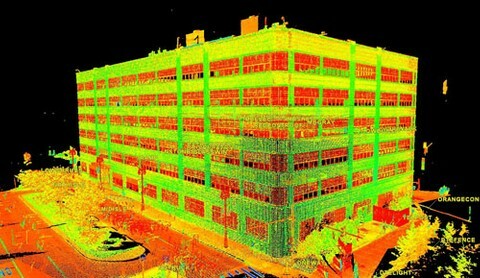 The laser scan technician captured all structural, architectural and MEP features. 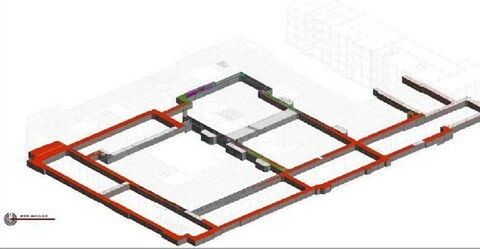 TruePoint captured the existing building conditions and generated a 3D model for the client. 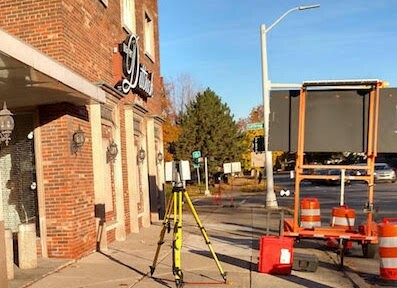 Task: Laser scan and capture 360° 3D color photographs, or TruViews, of one city block in downtown Detroit, Michigan, approximately 6.5 acres, prior to construction and pile driving operations. This client, a general contractor, wanted to document existing site conditions prior to beginning construction. Targets of acquisition included exterior building facades, parking lots, sidewalks and curbs. 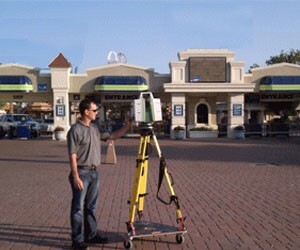 Task: TruePoint Laser Scanning provided as-built documentation for 10,000 square feet of retail space in a shopping mall. Half of the space was a ground-level storefront and half a basement area below the store. 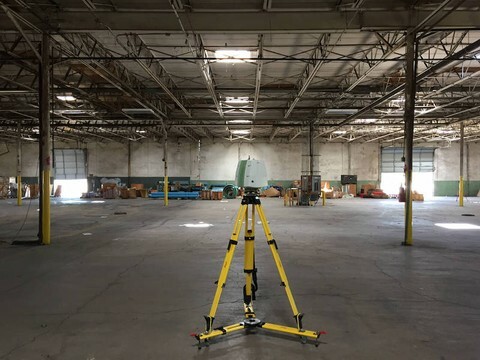 Using a Leica C10 survey-grade laser scanner, our laser scan technician captured walls, windows, doors, floors, ceilings, structural columns, supports, conduit, piping, sprinkler mains, chiller lines and a concrete deck in the space. A 3D model was created for the client. Task: To 3D laser scan the trunk and limbs of an existing tree in Boulder, Colorado. 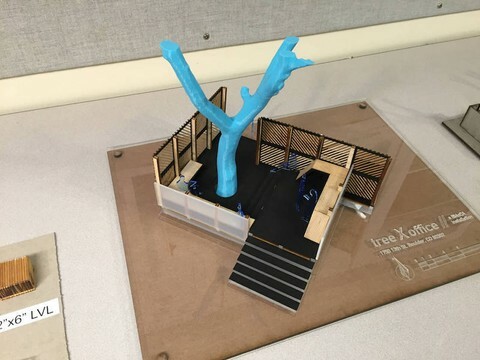 Architecture students at the University of Colorado used laser scan technology to design TREExOFFICE, an outdoor workspace built around an American Linden tree in a park on campus. The space offers a conference table, six desks, wifi, and a platform for people to work, sit, think, converse, speak, or perform. 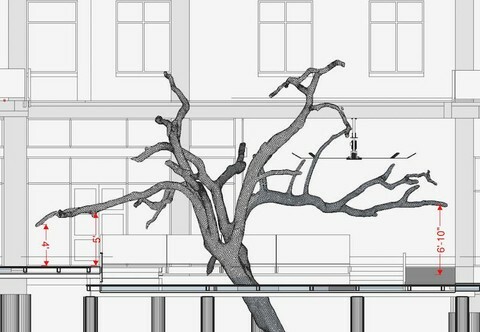 TruePoint created a 3D mesh of the tree to aid in the cutting-edge design and prefabrication of the office space. 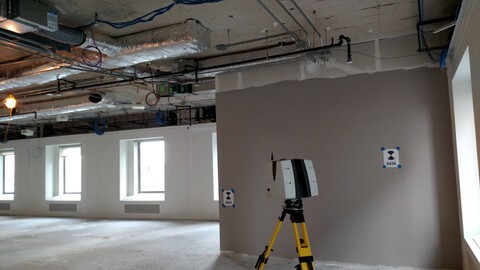 Task: TruePoint 3D laser scanned 40,000 square feet of office space on the 6th floor of a building in Cincinnati. The area was recently renovated and the objective was to capture MEP features to create an accurate as-built survey for the client. 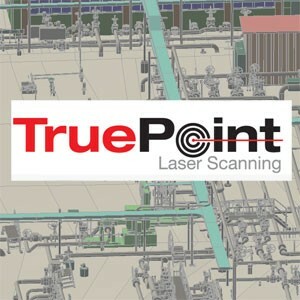 TruePoint’s scan technician used a Leica P40 ScanStation to capture 3D point cloud data and TruePoint’s in-house engineers created a 3D CAD model. 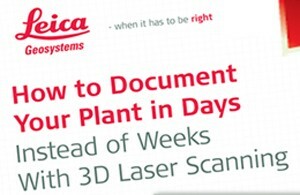 Task: Provide high definition laser scanning services for a 50' x 50' x 20' area in a biochemical processing facility. 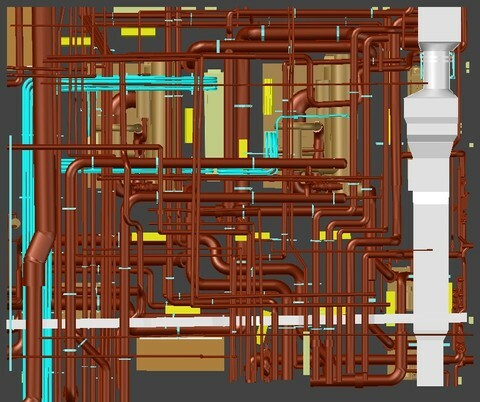 The client was replacing pipes to a hydration tank pump and desired a 3D model to plan and fabricate the new pipes, ensuring proper fit and avoiding clashes. 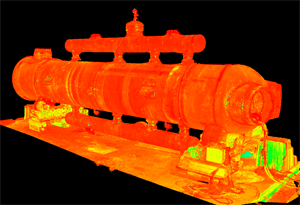 The objective for this laser scan was to capture vessels, piping, flanges, structural steel and pipe supports. 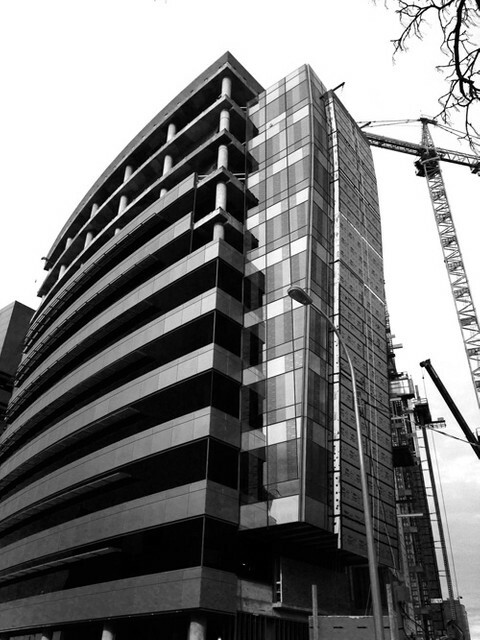 Task: TruePoint’s 3D laser scanning services were used in Denver, Colorado to capture the dimensions of an existing building façade for the installation of prefabricated paneling. A new construction apartment complex desired a 2D CAD drawing to expedite prefabrication and installation. 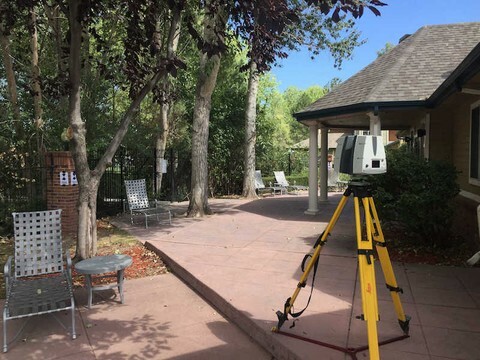 Task: TruePoint provided laser scanning services for a resort-style community offering luxury apartments & townhomes in Denver, Colorado. The client wanted to renovate seven clubhouses in the community and desired accurate floor plans of each clubhouse to design and expedite renovations. Nearly 50,000 total square feet of space was laser scanned to reality capture the existing condition floor plans and architectural and structural detail of the clubhouses. 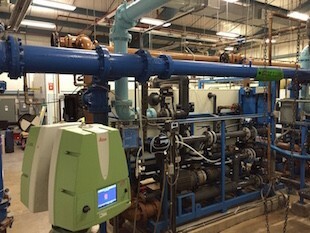 Task: TruePoint provided high definition laser scanning services for 2,000 square feet of mechanical space in a water treatment facility in Dallas, Texas. The task was to capture structural columns, beams, mechanical equipment, piping, conveyors and large bore piping. 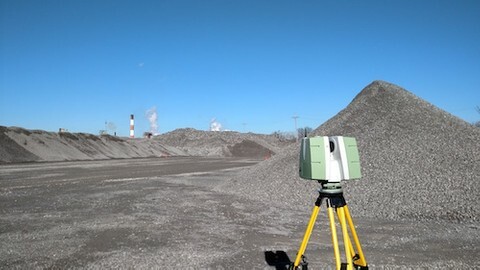 Task: TruePoint was selected to conduct high definition laser scanning and collect field measurements for a sewage pumping station in Detroit, Michigan. The interior and exterior of this location was 3D laser scanned to capture architectural, structural, mechanical, electrical, plumbing, instrumentation and controls of the facility and provide current as-built information for the client. This data was used to aid in design modifications and upgrades to the existing facility. 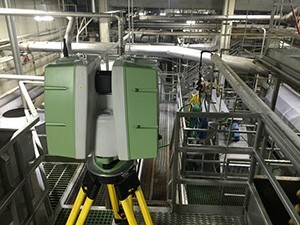 3D laser scanning was completed down to ½ inch in diameter. 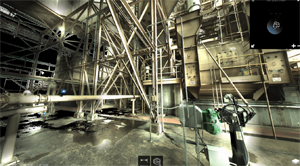 Task: TruePoint provided high definition laser scanning services at a grain elevator in Michigan to capture the as-is conditions of the site. The client needed an accurate representation of the structural features to perform maintenance upgrades. They wanted specific documentation of the bucket elevator legs, fill conveyor bridges and tower supports. Task: A global consumer goods company had a concrete floor in a pharmaceutical lab crumbling and bubbling. Ground Penetrating Radar Services, Inc. (GPRS) marked the utility and voids under the concrete. 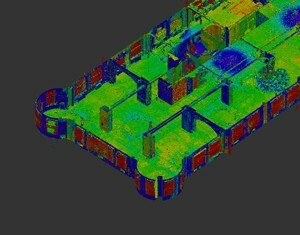 TruePoint provided 3D laser scanning services to document GPR under-slab findings for this client. 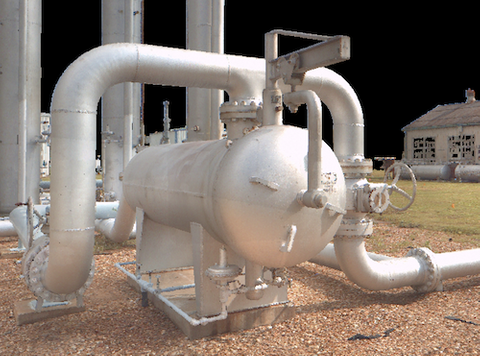 Task: Laser scan a total of 100 Natural Gas Separator Units and Metering Skids to capture detailed flange information, including bolt hole orientation, elevation information and pitch of flanges. 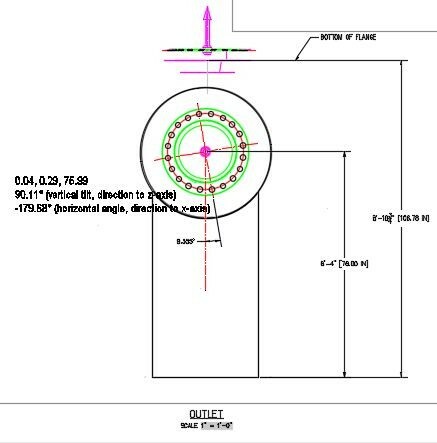 TruePoint generated 3D models of each skid’s flange for the client to verify the flange versus pipe orientation. The client used this information in pre-fabrication efforts to decrease their time making field changes during installation. Task: This client desired to capture the attributes of two 100-year old trees and include them in the design plans for a new development. TruePoint laser scanned the trees and created a 3d mesh for the client to include in the drawings. 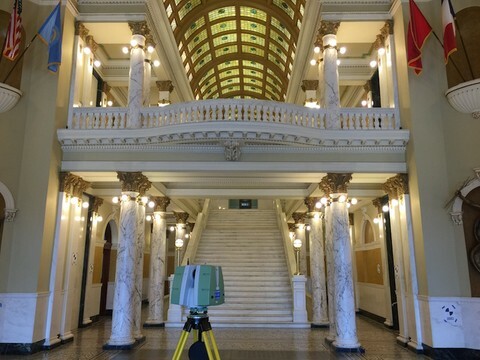 Task: TruePoint provided 3D laser scanning services for the South Dakota State Capitol Building. Completed in 1910, this architectural and historic landmark has a central rotunda flanked by legislative wings and features a copper dome, Corinthian columns, rusticated walls of granite and limestone, ornate plasterwork, murals, paintings and sculptures. The client wanted to capture the as-built conditions to document the architectural detail and historic art for restoration or should a natural disaster occur. 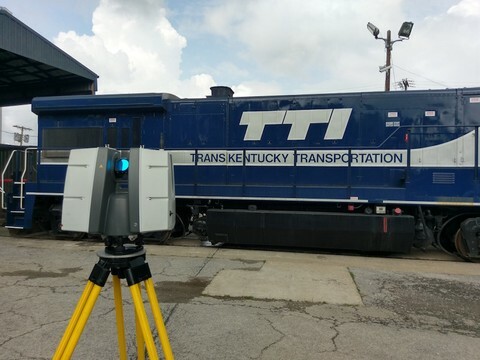 Task: TruePoint 3D laser scanned a 40-acre plant in Western Kentucky that provides specialty chemicals for a variety of industrial applications and personal care industries, such as pharmaceutical, food and beverage. TruePoint aided the client in the generation of isometric drawings for this 1955-built facility, which serves more than 100 countries. 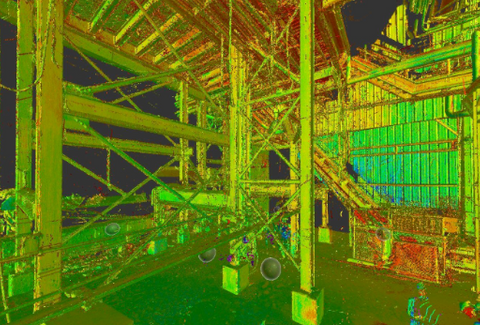 TruePoint laser scanned the interior and exterior of 20 buildings, tank farms, cooling towers, water treatment facilities, hazardous waste generators, refineries, retainage areas, processing towers, platforms and railroad tracks. The task was to high-definition survey all structural, mechanical, electrical and plumbing features, equipment and piping down to ½ inch diameter. 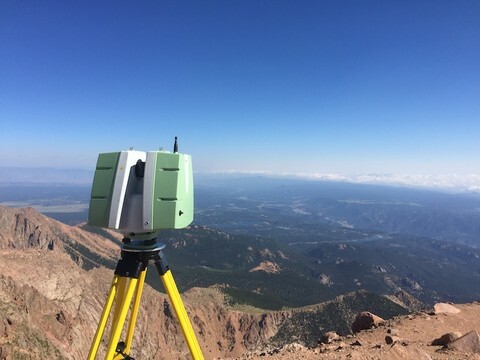 Task: Laser scan the existing conditions at Pikes Peak summit, tie to the surveyor’s existing survey control, and help the client use the raw data to gather the needed measurements. The ultra-prominent 14,115-foot mountain has the highest summit in North American and is located near Colorado Springs, Colorado. 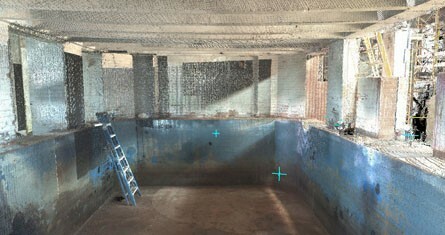 Task: TruePoint performed high definition 3D laser scanning for a concrete contractor in Brooklyn, New York. The task for this client was to capture laser scan data from 12 interior floors and 2 roofs and create 2D drawings that would verify floor flatness and slab elevations after the contractor had completed the pouring and finishing of concrete throughout the building. 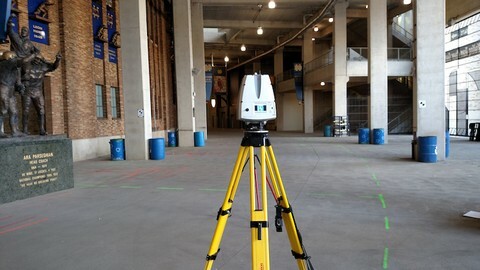 Task: TruePoint 3D laser scanned ground penetrating radar (GPR) markings locating underground utilities at a college football stadium. 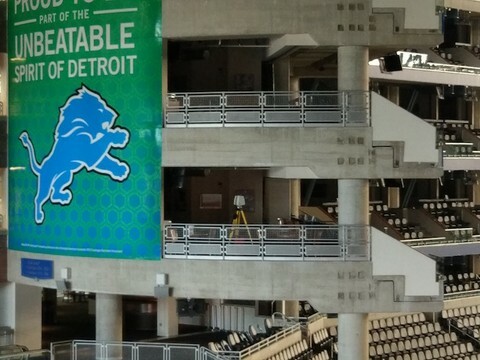 Our experienced technicians laser scanned and photographed over 160,000 square feet of space showing active conduit, water and sanitary sewer lines inside the stadium concourse. 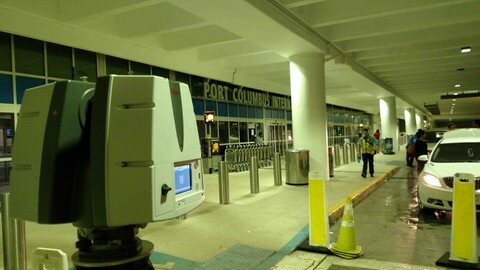 Task: TruePoint provided 3D laser scanning services for John Glenn International Airport (formerly Port Columbus International Airport) in Columbus, Ohio. The client was upgrading the existing airport entrance to add more curb appeal; renovations which included the installation of a prefabricated ceiling panel system and new doors. The primary objective of the laser scan was to capture the ground, curbs, ceiling beams and related structural features to design and prefabricate the upgrades. Task: This client needed to do some rehabilitation on a historic cathedral in Denver, Colorado. After experiencing 100 years of weather in Denver, the cathedral had damage to the exterior stonework. 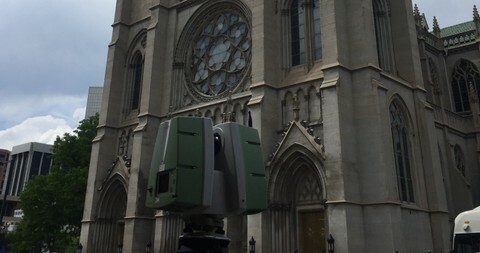 TruePoint laser scanned the exterior front façade of the historic cathedral and provided the client with 2D drawings. 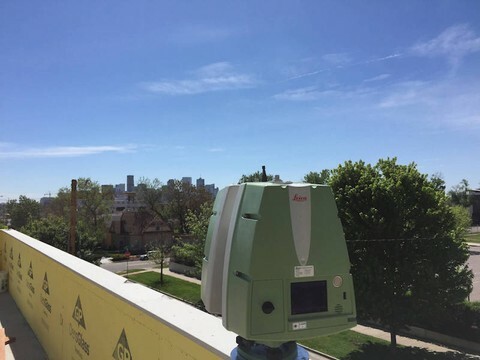 Task: Utilize 3D laser scanning services to create current and accurate as-builts of a historic building in Fort Collins, Colorado. The client purchased a bar and grille and planned to turn it into a mid-sized music venue. 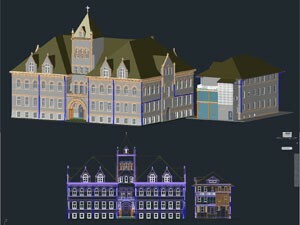 TruePoint high definition laser scanned the interior and exterior of the building to produce a 3D model for the client. 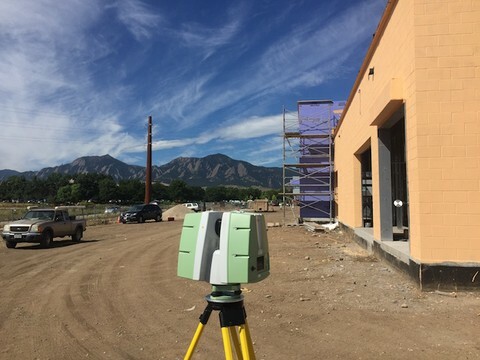 Task: TruePoint’s 3D laser scanning services were used in Boulder, Colorado to capture the dimensions of an existing building façade for the installation of prefabricated paneling. Task: The client wanted to laser scan the locomotive and turn it into a museum-quality HO scale train to sell to train enthusiasts through its website and dealers. 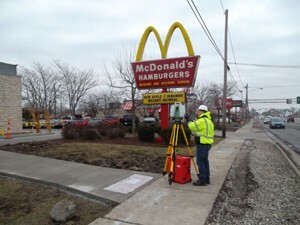 Task: TruePoint used laser scanning in Cleveland, Ohio to survey approximately 130,000 sq. 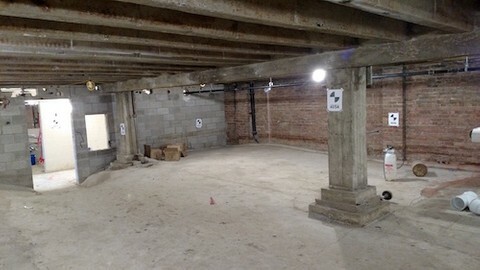 ft. of space after selective demolition at a school. Task: The client needed laser scanning services to create a 3D model to aid in constructing a new building amid the existing buildings. 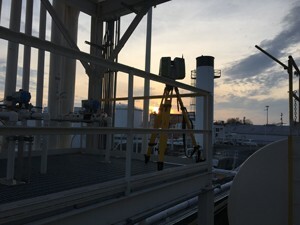 Task: Using Lidar mapping, TruePoint laser scanned a steel platform near Indianapolis, Indiana. Task: To use Lidar technology to laser scan a Vapor Recovery Unit (VRU), capturing piping, tanks and other mechanical, electrical and plumbing features. The client requested a 3D model of the VRU. 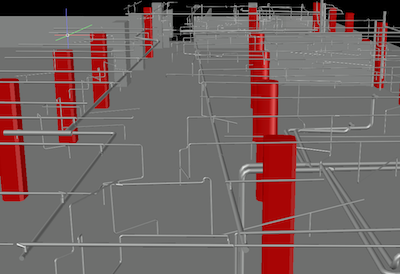 Task: To laser scan the interior of a series of interconnected pre-engineered buildings for the purposes of generating structural framing plans. 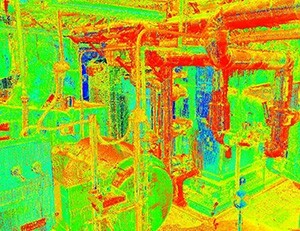 Task: To laser scan an active natural gas compression station to provide the client with as-builts of the facility as well as clash detection for future renovation and expansion. 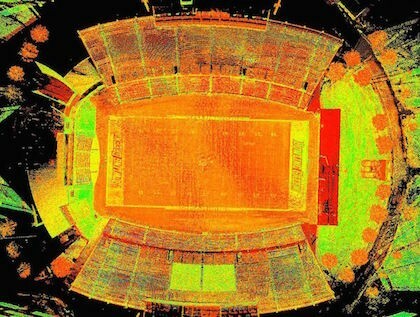 Task: Provide 3D laser scanning and photo documentation of the existing condition of the college football stadium, seating and concrete steps prior to beginning construction work. Task: TruePoint was requested to return to the site and laser scan additional areas of the facility, capturing structure and equipment for the siting of new equipment. Task: To provide the client with very precise measurements on the interior of a cement kiln inlet area and the kiln inlet transition piece, including the riser. Task: To provide the client with an accurate floor plan of the existing corporate office building. 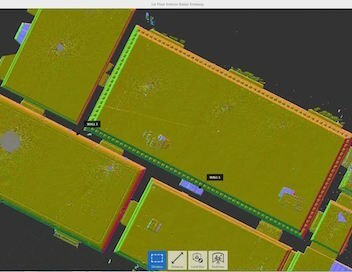 Task: To provide the client with a colorized point cloud of the facility and track to be used for developing a dimensionally accurate and realistic 3D video game. 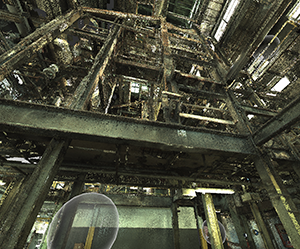 Task: Scan the interior of a scrap room at a sheet metal stamping facility to capture walls, floor elevation, ceiling height, columns, beams and an overhead crane support structure. Task: To laser scan the walls of an abandoned Italian Embassy for the purposes of wall plumb analysis. 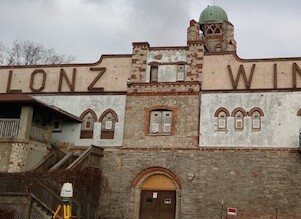 Task: To Laser Scan the façade of a historic winery in order to accurately capture the detailed window openings for fabrication dimensions. 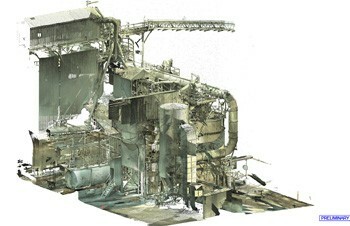 Task: To laser scan piles of scrap metal for auditing purposes. 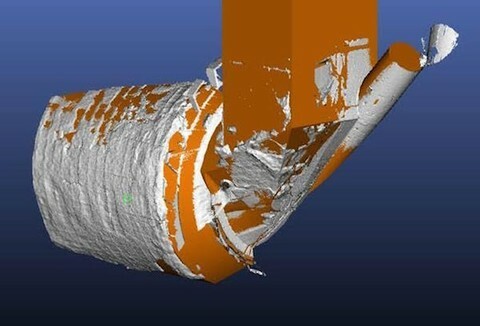 Task: To utilize 3D Laser scanning to laser scan an existing corrugated metal culvert pipe. Task: To laser scan a water membrane filtration system, including the tanks, valves, control panels, and associated piping - some of which is as small as a half-inch in diameter. 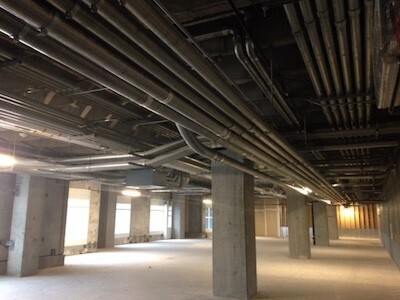 Task: To capture existing piping and conduit for an equipment upgrade project. Task: To provide the client with information on the structure for the fabrication and installation of aluminum composite panels. Task: To capture the interior and exterior of a newly built compressor building. The measurements were to be used to create accurate as-builts of the building as well as the equipment, piping, and conduit associated with the system. Task: To document the historical exterior façade of a landmark building set for demolition. Task: To laser scan both the interior and exterior of Frank Lloyd Wright’s Unity Temple and produce a 3D BIM model for historical renovation documentation. 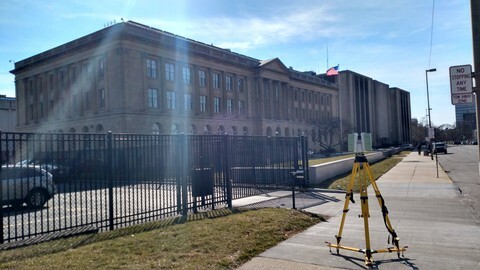 Task: To 3D laser scan the north, south, and west building elevations and towers of the welcome building at a key Chicago tourism destination. Task: To scan, measure, and document the architectural façade elements of the Wayne County Courthouse, located in downtown Wooster, before it underwent historical preservation. 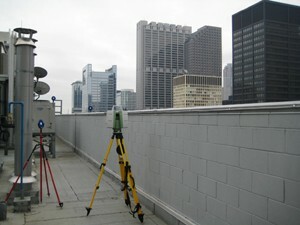 Task: To laser scan a late 19th century historical high rise in Chicago's Central Loop. 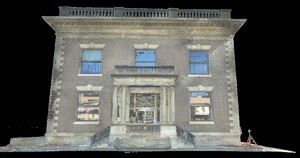 Task: To scan the exterior façade of a historical building to document it prior to demolition. Task: To capture the exterior structure and architectural features of an intricate historical church façade. 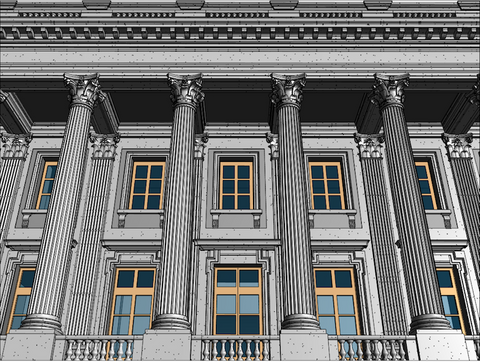 Task: To capture the exterior façade of the building, including all architectural elements. 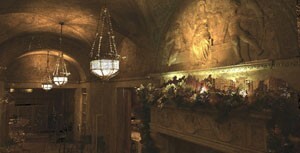 Task: To document the intricate architectural detail of the existing interior hotel walls. Task: The client needed to create as-builts and needed accurate room dimensions, beam and column detail, elevations, and dimensions on all mechanical piping and conduit. Task: To laser scan a building before installing metal paneling to verify that the exterior walls were level and uniform. Task: The client is converting a 1980s office building to a luxury hotel, and needs to locate tension cables and rebar to accurately place mechanicals. To facilitate the design, the client needs precise documentation of the substructure and surrounding structural elements. 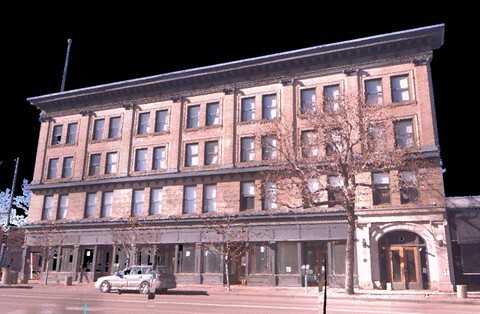 Task: Scan the interior of a building of historical significance constructed in the late 1800s and modified in the mid 1900s with an added second story. Support Columns and Beams on the first floor were the focus of the scan in order to analyze the building’s structural integrity and bring it up to current required building and loading codes. 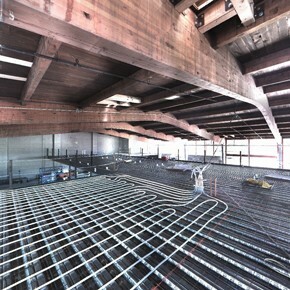 Task: To scan multiple floors and map out the radiant heat tubing in the flooring prior to concrete being poured. Doing so would allow the client to safely proceed with any cutting, coring, or drilling that may need to be done, without the concern of hitting any tubing or conduit. Task: To create as-builts of a fuel terminal Vapor Recovery Unit, or VRU. TruePoint was called in to capture tanks, piping, and other MEP features, as well as secondary containment areas. The client was going to use the data for clash detection and pre-fabrication purposes. 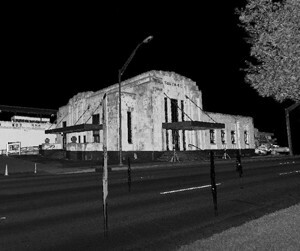 Task: To complete a 3D survey of a historic Oklahoma City landmark in conjunction with OKC’s urbanization efforts. Task: To scan the entire interior of an abandoned warehouse, capturing architectural and structural elements for as-built documentation. Task: To verify welding and wide flange alignments on two (2) separate oil vessels prior to being transported and installed. Task: To capture the as-is conditions for pre-planning, fabrication, and clash detection for the addition of a new system. Task: To capture dimensions and locations of key features in lime plant, such as overhead conveyors, ductwork, piping, chutes, hoppers, shelter houses, exterior building footprints and steel structure support. Task: To capture the edge of slab of multi-story hospital structure as it was being built to verify it was built to specifications and identify any discrepancies prior to fabrication of building envelope system. Task: To laser scan a series of above ground pipes connecting various solids tanks and filter structures at a water treatment facility. Task: To create, as part of the overall engineering survey, an as-built of the interior and exterior of the entire building structure, which included 6 stories of parking garage, 2 floors of retail space and 8 levels of office space. 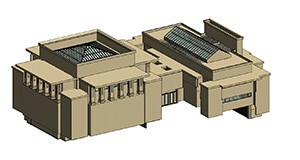 Task: To accurately capture the as-built conditions of the interior and exterior of the building. Task: To capture as much of the as-is conditions of the facility, including overhead obstacles, to be used for pre-planning, fabrication, and clash detection for the addition of new equipment to the plant. Task: To capture the architectural and structural detail of the exterior façade of a historic firehouse being renovated and updated to handle current needs of the fire department. 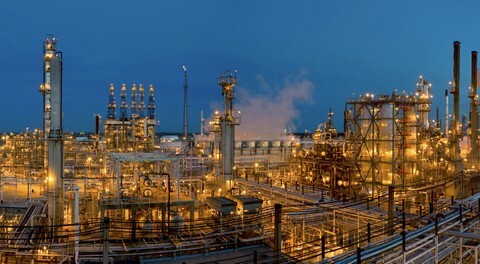 Task: To scan part of a complex process piping and support structure system for a refinery in order to create a base model. 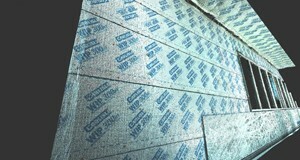 The model will be used to plan and design an upgrade to the existing system. 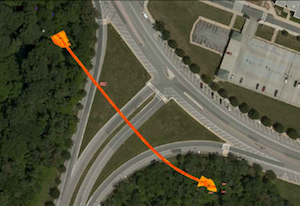 Task: To map out the existing location and conditions of the underground utility tunnels for a variety of applications including: identifying location, elevations, slope, tunnel structural features, identifying/locating utilities, etc. 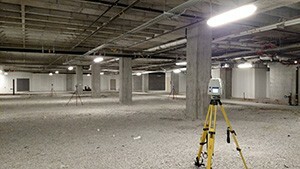 Task: While following behind Ground Penetrating Radar Services, TruePoint Laser Scanning's task was to create a permanent record of the locations of rebar, post-tension cabling, and electrical conduit in and under the concrete of a parking garage structure and then document GPRS's findings in a 3D CAD model. 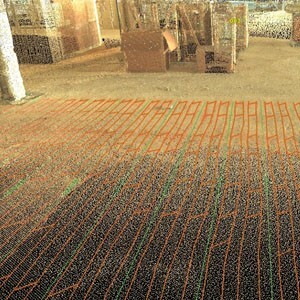 Task: Using 3D laser scanning after GPRS marked their findings on the concrete surface, TruePoint was able to capture their markings and the surrounding building structure and put it into a 3D model that the engineers were then able to import into CAD and layout their coring plan. Task: To capture and model the exterior architectural and dimensional details of a historic church which has a variety of door and window openings, various levels of roofing, and a bell tower. Task: To capture and document the existing conditions of the historical building’s interior and exterior. Task: To scan the three main tanks of a water purification system in order to capture information regarding their exact sizes, locations, and spaces, as well as all of the structural and MEP features associated with the existing units. Task: To scan the exterior of the church and adjacent school building in order to capture the dimensions and features of the two buildings. Task: Forensic scanning of remaining historically-significant building structure after a fire destroyed most of the building to assist with historical preservation and the re-building process. 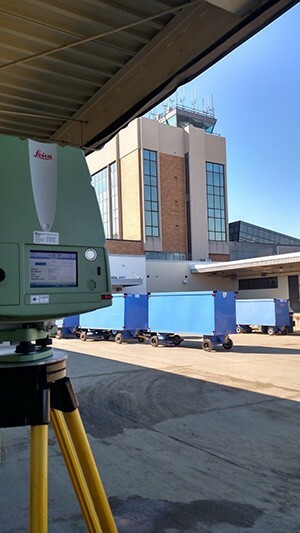 Task: Utilize LIDAR technology to laser scan the exterior of three building facades surrounding an outdoor baggage processing area of approximately 22,000 square feet. Building columns and significant features were the focus of the scan in order to analyze how a new structure would interact with the existing building. Task: Laser Scan the interior of approximately 17,000 SF of Hospital Kitchen to capture all exposed MEP and conduct a floor fill analysis. The contractor and architect also wanted to see where installed systems aligned with their proposed model. Task: Scan the interior of a multi-level building, interior steel platform structure, and exterior facades of a boiler room to identify existing structure, exposed MEP, and basic architectural features such as doors, windows, and walls. Task: To laser scan the interior of utility tunnels underneath a college dorm in order to obtain the basic tunnel structure, including walls, ceiling, visible concrete beams, and floor, but focusing, also, on capturing the water main that supplies the fire protection system. Task: To capture the dimensions of all the window openings on the building. Task: To accurately capture the "as-is" conditions of an existing space so that the client could design a new space and be assured that the MEP components would not clash with existing features. Task: The steel is located approximately 100 feet overhead and is, therefore, only accessible using a lift and, in some cases, not even with a lift. 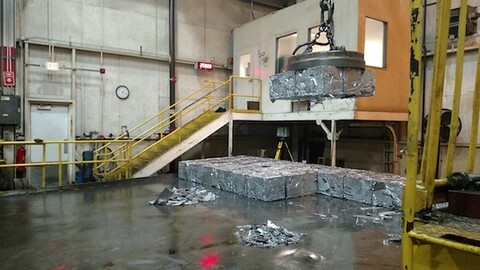 In addition, the sheer amount of steel makes it impractical to document using traditional methods. Task: The construction management firm needed to determine the size and location of steel beams and structure located two stories above the hotel atrium entrance for renovations that were going to take place. Task: To create as-builts of the interiors and exteriors of three recently acquired buildings, as well as elevations and contours of the surrounding parking lot area for the purpose of both design planning and the development of a proper drainage system. Task: To scan a complex-shaped wall feature so that steel components could be pre-fabricated to fit the wall correctly on first attempt. Task: TruePoint Laser Scanning was to use their scanning equipment and follow behind Ground Penetrating Radar Services as they marked out underground utilities on the ground. 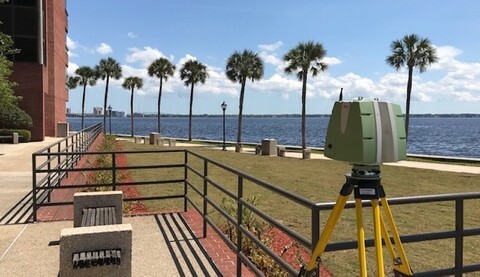 TruePoint would scan and capture their findings, which would also include the topographical and surrounding features of the area (building, signage, etc. ), and deliver them into a 3D CAD model. Task: In preparation for a hotel’s renovation which was to include a retractable roof, TruePoint would use their laser scanning equipment to create a complete as-built of the hotel’s existing rooftop patio. 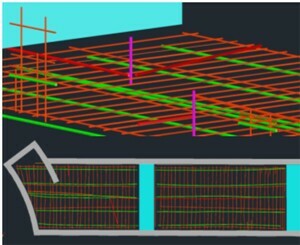 Additionally, TruePoint would scan to locate the necessary support columns for the fabrication of a new steel support structure to be installed as part of the addition. 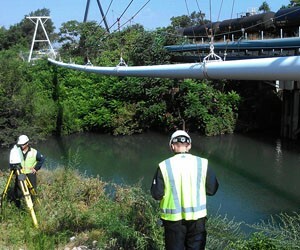 Task: To scan a pipeline spanning above a river, in order to capture the pipeline's dimensions and document and analyze its existing condition and support structure, including the extent of pipe sag. 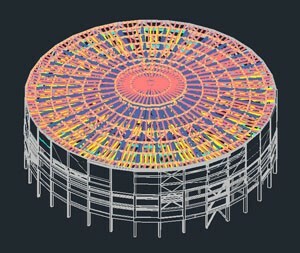 Task: To scan the interior and exterior of a two-million-gallon water storage tank and provide a detailed tank analysis. The county was interested in documenting and monitoring any changes in the shape of the tank and the contouring of the floor and ceiling slabs over time. 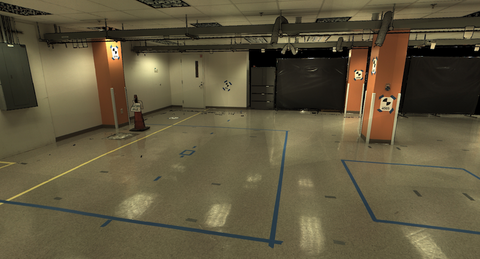 Task: To capture all visible pieces of equipment in two 20’ x 40’ mechanical rooms. The measurements were used for designing and installing new systems to interface with the existing equipment. Task: To scan multiple areas in the process plant in order to capture information regarding the size, location, and space of existing equipment, along with all the structural and MEP features associated with the units. 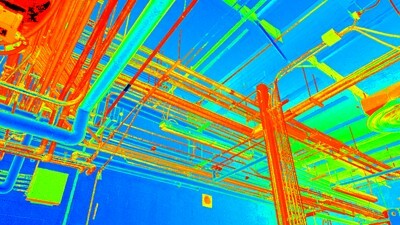 Task: To scan an active terminal and load rack and provide the client with a colorized point cloud. The scanning of the facility was requested by the client in order to provide them with as-builts as well as clash detection for future renovation and expansion. Task: To scan the hospital’s mechanical room in order to create a 3D CAD model to be used for facility upgrades, retrofits and avoiding clashes. Task: To create 3D as-built models of five (5) small volume provers to be used for re-engineering and designing future small volume prover trailers. 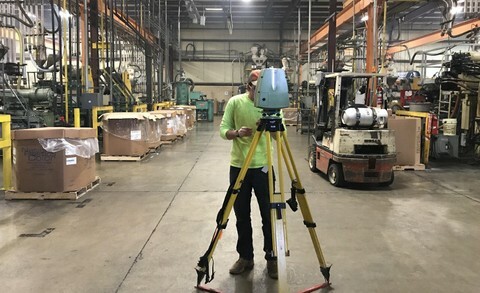 Task: In preparation for plant expansion, the entire interior of a 250,000+ square foot manufacturing facility needed to be scanned in order to create a 3D CAD model of the building.